Since we last spoke, there’s been another one of those birthday things. You know, another year older and wiser blah blah. I’ve never much been focused on the gradual incremental inevitability of that number’s rise. Indeed, I remember one year I spent most of the year thinking I was already a year older than I actually was. I was quite pleased when my birthday arrived and I realised that I’d been wrong all that time and was therefore a year younger than I’d realised. I suppose the fact that I was pleased does show up the truth. I’m not like one friend I once had who hid under the duvet when New Year and birthdays came along, but however blasé I am about the number I would still like it to be a little less. Whatever - it is what it is. Not wanting to be too morbid about this, they say that the flowers smell sweeter the closer you are to the grave. And that’s a good excuse to make sure that you mark every birthday with a damn fine meal, since you’ll be in a highly receptive frame of mind to enjoy every mouthful. Apologies if you’re just a youngster and therefore (a) filled with the certain knowledge that you’re pretty much immortal and (b) therefore confused as to what the heck I’m warbling on about. My partner had chosen the restaurant for my birthday. There are plenty of fine places in Norwich to choose from so I was looking forward to whatever appeared. In the event, it was Bishop’s Dining Room and Wine Bar. It wasn’t a place that had appeared on my radar to date, but then I’ve not been eating out so much in the last few years. It’s a charming and small restaurant to be found on St Andrew’s Hill which, apparently, is the oldest lane in Norwich, which has to count for something. We were early. Our intention to consume a fulsome quantity of alcohol meant that it was the bus into the city, and public transport rarely organises itself to fit your timings. In that situation, you can either wander around looking in shop windows and pretending to be fascinated (you might well be, of course. For me, window shopping is time wasted, not the sort of thing when you’re a year older etc. etc.) or you can simply announce yourself and see if your flouting of the designated timings create panic. Of course, we did the latter. There was no panic. When you first walk in, there’s a bar area where you can choose from a pretty impressive range of wines, gins and other drinks. We chose Chablis, and chatted with our extremely friendly and personable host about restaurants in the city, and local food culture. There’s a highly under-rated skill in being a great host. This one reminded me of the best bar host I ever came across on a birthday trip out in Toronto, if I recall correctly. The skill of that particular host was reflected in the fact that I nearly missed my flight the next morning, managed to drag myself to the airport with head thumping only to realise that in my befuddled state I’d left my behind my Psion organiser - the state of the art for the tech-enabled executive back then. Ah, happy days. Excuse me. Nostalgia. Birthdays. They come together. Our starters were both born of the sea. Seared cod cheeks, with samphire, cockle popcorn, lemon and cider beurre blanc for one, tempura king prawns, lime and sweet potato purée, roasted chilli cauliflower, mango and lime dressing for the other. Both were delicious. The most notable element, of course, was the cockle popcorn. It’s not actually popcorn, of course, but the cockles are coated with a crunchy shell that makes them similar in appearance and texture - it could have been gimmicky but it actually felt very much at home on that fine plate of food. 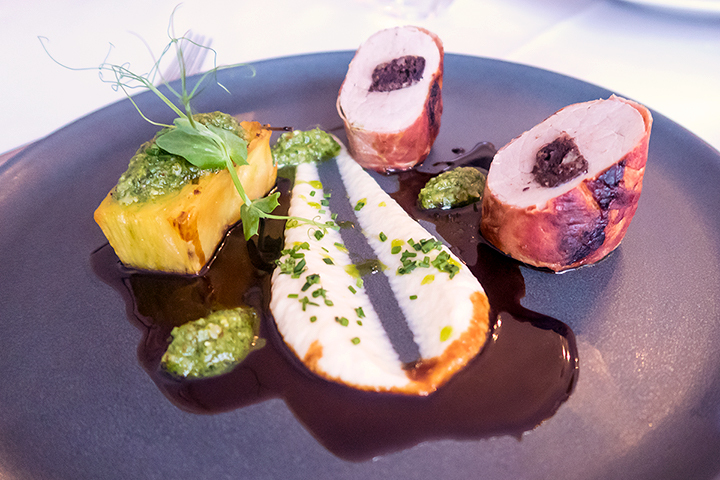 For the main course, I went for roasted pork fillet encased in crispy ham, with local wild garlic pesto, black pudding, cider and potato press. For me, this was the perfect balance, and a reminder that wild garlic is a thing that I’ve still never cooked with. That’s another one added to the list. Perhaps I should get some for the garden. I just have a vision that it could easily take over if not kept in tight check. And speaking of ‘one day I’ll add that to the garden’, then there is rhubarb. Specifically, the rhubarb and custard panna cotta. By custard, of course, really we just mean vanilla but it plays on our memories and since birthdays are all about nostalgia and, well it had to be done. 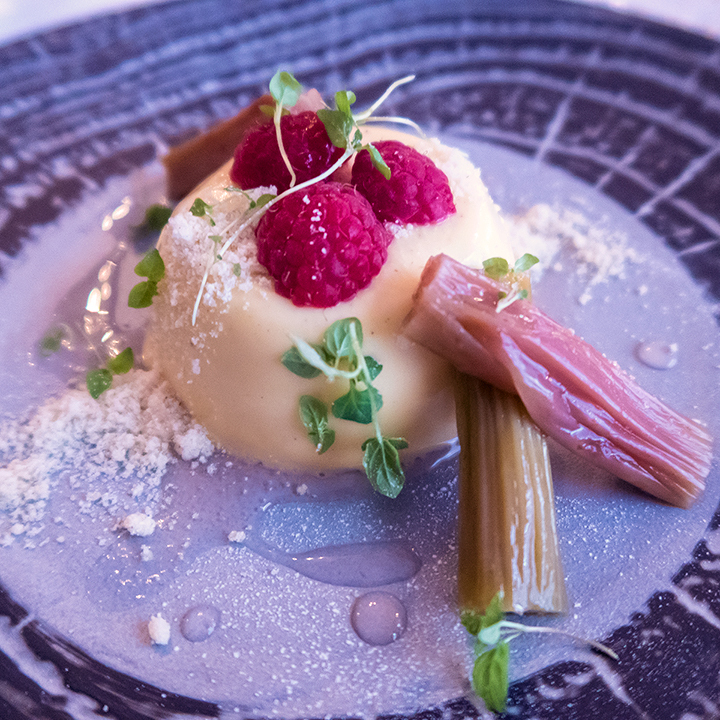 Needless to say it’s a delicious balance, with the sharpness of the rhubarb (and sweetness of accompanying raspberries) cutting through the creaminess of the panna cotta. 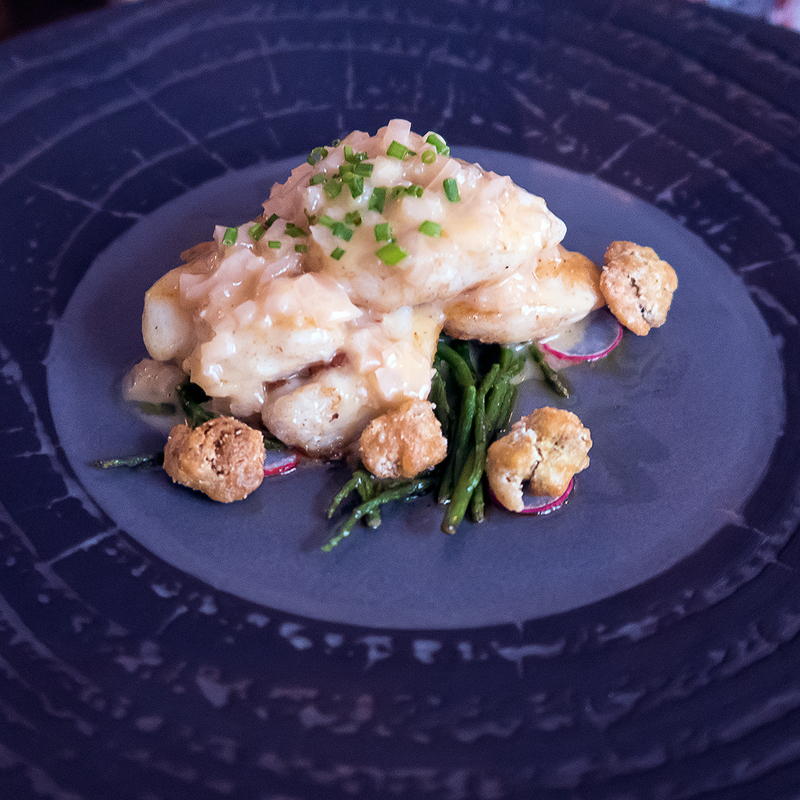 Bishop’s doesn’t sell itself with any pretension - something that the Guardian critic Jay Rayner celebrated when he described it as ‘simple things done well with attention to detail’ - the review is hung proudly on the wall. I can do fancy and pretentious, but for a birthday meal beautiful food, perfectly cooked without a single mis-step, that will do very nicely, thank you.